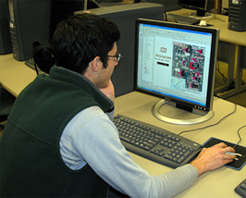 This course provides students with the basic concepts and principles essential in applying geographic information systems (GIS) to practical project development in areas such as natural resource management, urban studies, and geographic education. Topics covered in the course include data collection, data quality and metadata, data structures, visualization, and spatial analysis and modeling. Students work with a community partner to complete a collaborative class project. Lab section is required. Three lecture hours and one laboratory hour per week required. Materials fee is required. Prerequisites: Geography 225 or permission of the instructor.